I can’t even tell you how many times I’ve made this recipe for Peanut Butter Balls. Nor can I count how many peanut butter balls I’ve eaten over the years. Way too many that’s for certain. In fact, I had to take a 10 year hiatus from making them because I just couldn’t stomach them anymore. Even though that might have been due to the drinking beer while making peanut butter balls one year, the two don’t go together! A few years ago I decided to get back on the horse and make balls again for the holidays. My daughter-in-law Kim loves peanut butter and chocolate. She told me once she’d like to take a bath in peanut butter and chocolate. I said she didn’t have to go that far! That year I gave the kids an assortment of homemade candy and included peanut butter balls. Kim took one bite and said,”I have to have the recipe.” We’ve been making balls for Christmas ever since. 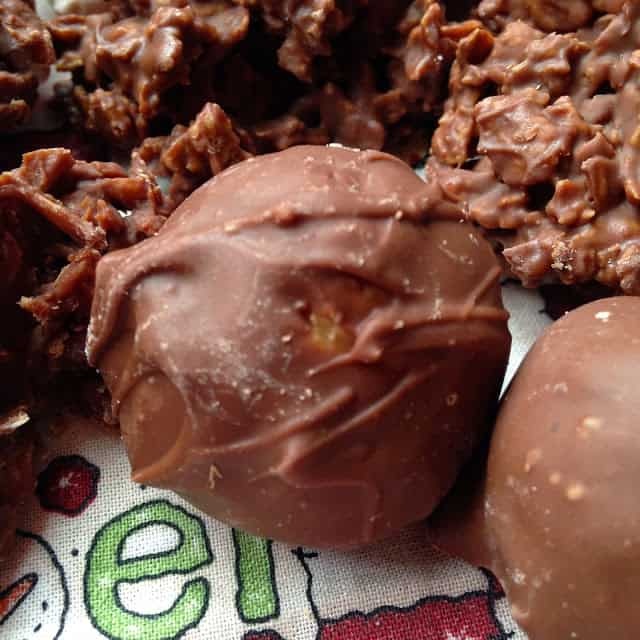 Christmas Candy Making time is here and we have included family favorites like this recipe for peanut butter balls. Some of the recipes have come from other sources like Taste of Home but all of the recipes have been taste tested by us. Rich Buttery Caramels is one such recipe. It comes from a Taste of Home Annual Cookbook and it’s fantastic. We hope this recipe becomes a holiday favorite in your family too. 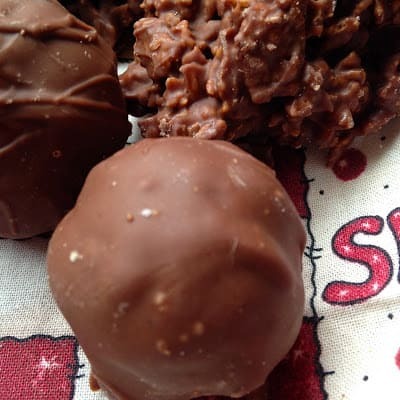 Peanut Butter Balls are a traditional Christmas candy in my family. In a large bowl cream butter. Gradually add confectioners' sugar, cracker crumbs, peanut butter, and vanilla. Shape dough into balls. Place on wax paper lined baking sheets. Refrigerate 30 minutes or up to 2 hours. Place chocolate in a large glass bowl, melt in the microwave on high power for 45 seconds, stir. Repeat until chocolate is smooth and creamy. Coat chilled balls in melted chocolate. Place on waxed paper to harden. When chocolate has harden, store balls in tightly covered container. For this recipe we used Skippy Peanut Butter and Honey Maid Graham Crackers.